There are number of browsers available for android operating system but only few are there which are most used and even most loved by all of us and in this long list we can't forget UC browser. UC browser is well known for its faster speed and simplicity. This is the reason why it get this much popularity in a very short period of time. What the developers team said is that their browser has fastest downloading speed and no doubt, this statement is true to full extent. Most of the people use UC Browser for surfing purpose only and if you're one of them then you're surely missing some of the its best features. 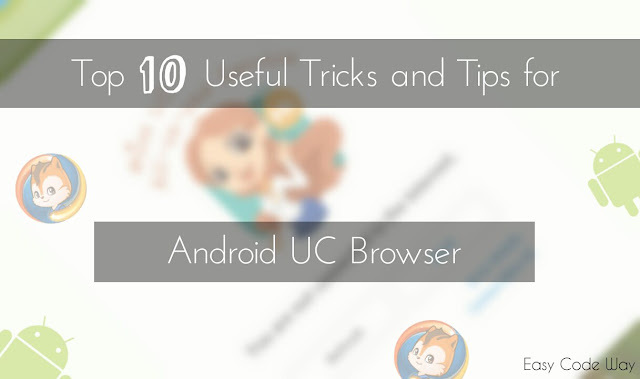 In today's tutorial I am discussing on top 10 coolest and useful android UC browser tricks and tips that you surely gonna love. All of them are listed below with their complete explanation, uses and steps by steps instructions. So let's Begin. 1. 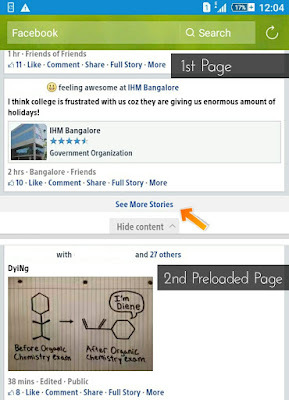 Simply open UC browser from your android device and click option menu button. ( three lines from the bottom list ). 2. Now scroll to left and select "Settings"
3. Under settings, you will find "Clear Record" option. Just click it. 4. A small pop-up box will appear. Tick mark all things ( including cache, cookies, forms, history ). 5. Finally hit "Clear" Button and that's it. 2. Now select "Font & Layout". 3. Here you will find three options as "Auto Font Size", "Enhance Layout" and "Force page to zoom". Simply enable last two by moving the scroll button next to each and drag the slider to adjust page size for comfortable reading. Let me ask you one question. What did you choose when it comes to performance and appearance. Well the most percent of your answer depends on your Internet speed. If you have high-speed Internet ( say 50+kb/sec ) then you don't need to worry about anything as it can give both better performance and appearance. On the other hand if you have low internet speed ( again say less than 50kb/sec ) then you need to compromise with appearance over performance. This is what we are going to do this time. 1. 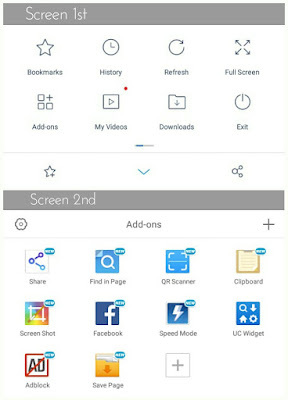 Go to UC browser Settings. ( click menu list button and scroll left ). 2. The second option would be "Text-Only". Simply scroll the button next to it. 2. Now find "Browsing Settings". 3. A new window will open, select "Image Quality". 4. A drop-down menu will appear. Select the option as you want and save changes. Let me take an example to explain this trick in more advanced way. Whenever you visit google and search for some keywords, it will display only first result page. In order to check second result page, you have to press "Next Page" button. Now tell me how it would be when all pages be automatically loaded before you open them. Same can applied on Facebook Home feed also. All we need to do is to enable Preload Page option. 1. 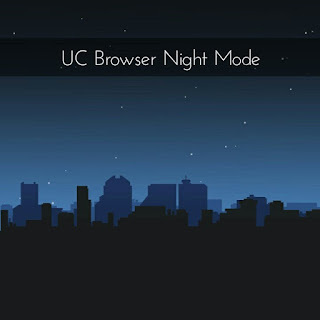 Again open UC Browser Settings. 2. Now Click on "Preload Page" option. 3. A drop-down menu list will appear. Select "All Pages". Most of the websites have separate version for desktop and mobile view but not in case of those which are responsive in nature ( exceptional ). In short, responsive website is one which adjust layout to fit full screen. Here I am talking about on those websites which aren't responsive. 1. 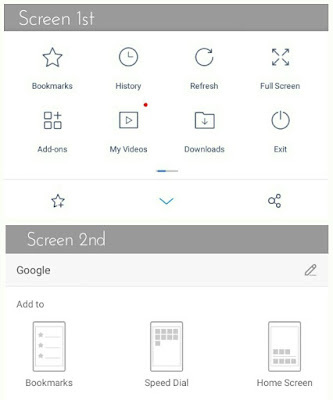 Open UC Browser and go to "Settings">"Browsing Setting". 2. Now scroll down to bottom and select "Website Preference". 3. A new window will open as shown in below picture. Simply click each option and change them to your choice. I prefer to use Lite Version. 1. Click on menu button and scroll to left. 2. Now click "Night" option. That's it. If you want to revert these changes, simply undo all steps. 1. Go to web-address which you want to save as bookmark. 2. Now click menu button. 3. To the left side of bottom line, you will find star mark with plus sign. Click it. 4. Now it will ask to add either as "Bookmark", "Speed Dial" or "Home Screen". Select 1st one. To check complete list of bookmarked pages, go to menu list and select "bookmarks" option available at the 1st position. 1. First click menu button ( three lines ). 2. Now scroll to left and select "Themes". 3. Here you will find 3 moving windows with title as "Themes", "Wallpaper" and "Background". 4. Just choose any one ( say I choose themes ). 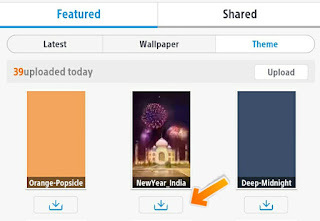 If you haven't downloaded any theme, click plus button and select "online themes" option. 5. It will redirect you to the "skin" sub-domain of "ucweb". Now surf all themes and download best of bests. 6. Finally Apply your downloaded theme. 1. Click menu button and select "Add-ons" option. 2. Here you will find all already installed extensions. Use them or if you're fed up with these, click plus sign to add more. 3. It will move you to the "addon" sub-domain of "ucweb". Simply select your favourite add-ons and click "Install". 4. Now It will redirect you to the google play store. Click "Install" button and allow permission. That's it. You've successfully added it. 5. Again go to add-ons option in UC and select the downloaded one to use it at any time. 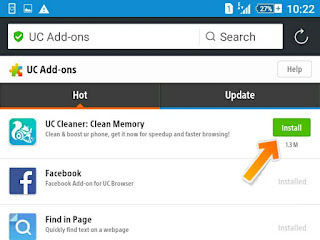 So these are the best top 10 tricks and tips you must know while using android UC browser. There are plenty of few more. However they are very simple and doesn't need any explanation to understand. So better try them yourself. Finally if you have any query or doubt, don't hesitate and let me know in below comment box. All above Tricks & Tips are tested in android device with 5.0.2 Lollipop Version and UC version - 10.4.1. If any of them doesn't work for you, please do update both things with latest version.